Maybe the Scottish brogue was throwing me. I don’t, after all, have a particularly good ear for Celtic cadences. Having a knack for inappropriateness I never knew myself capable of since moving to Japan, I assumed my brain, under the influence of diabolic dyslexia, registered the offering as “fish sperm”. However, the pale intestinal thing he jiggled at me with a pair of chopsticks was indeed fish sperm, known culinarily as milt, defined by TheFreeDictionary as “seminal fluid produced by male fish”. You can watch this gloriously discourteous video on Shirako, the sperm sacs of a male cod. Earlier that day, during my lunch at the Fukushima branch office, I had already dared my digestion by trying some packaged fresh fish from the 7-11 convenience store, which I later found out to be a type of Japanese blue-backed fish (背の青い魚; this one most likely a kind of mackerel), mouth-wateringly sour, succulent, sweet, and unfortunately stubbornly pungent (my apologies to any post-lunch students or coworkers reading this). Following my painful ordeal of having (knowingly) ingested glutenicious yet delicious Japanese foods during my first week or so here in Koriyama, I’ve been vigilant in my efforts to eat only natural foods with no fancy dressings such as those in the ubiquitous and customary soy sauce—soaked dishes. 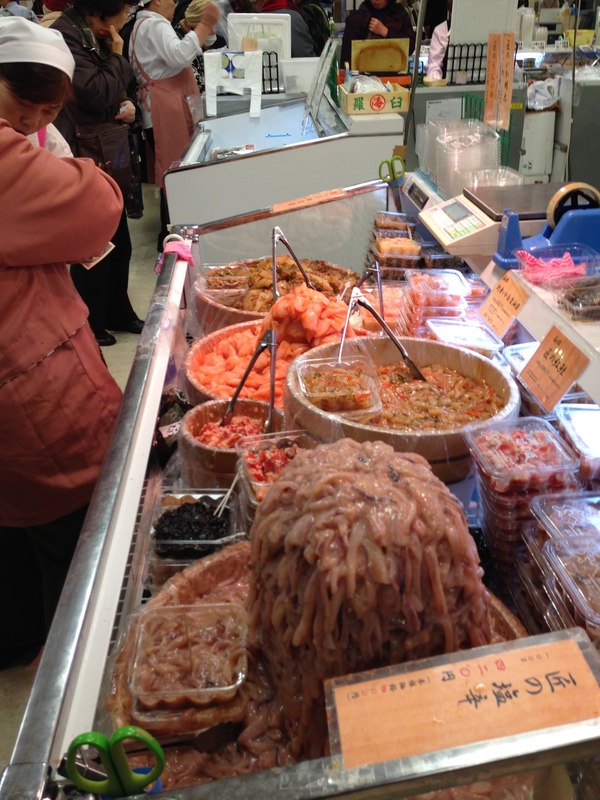 But outside the inviting glow of restaurants and under the fluorescents of the supermarket, the world of Japanese cuisine has not ceased to amaze me with its selection of the weird and wonderful. On a rather slow yet sunny Monday, my usual day off, I ventured to Usui at the behest of some clever students who suggested I visit this downtown, ten-floor department store to find some much-needed Japan-style postcards to send to family and friends (hold on, they’re coming!) – these being the same students who fawned over their favorite dish, Omuraisu. 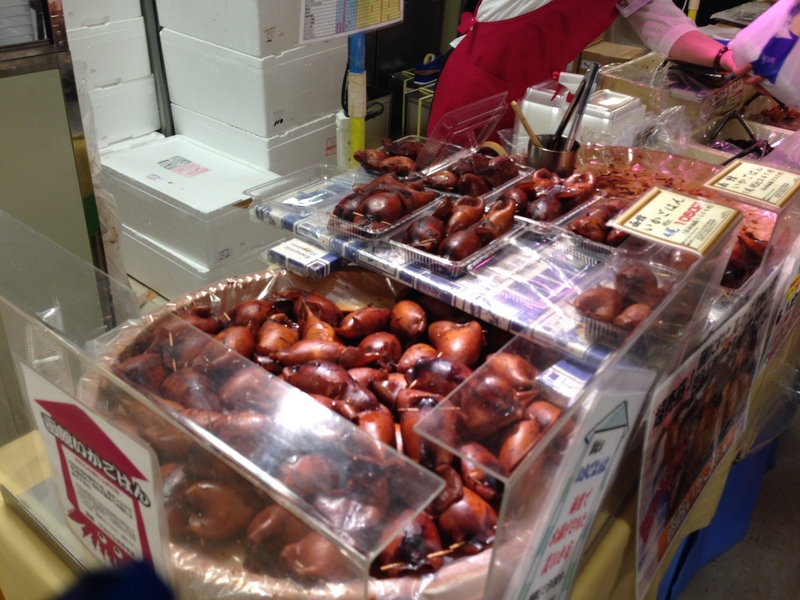 On the top floor, I stumbled into a maze of market stalls and smells I have never smelled in my 26 years of smelling. I saw foods and creatures I’ve never set sights on and some I never want to again. Disturbingly beautiful mounds of translucent red roe eggs precariously spilled atop basins of ice, hewn blocks of hardish pink and green marine, and the kawaii-est (cute) cubes of chocolate and perfectly circular balls of lightly dusted mochi – everything so pleasing to the eye and yet so utterly unknown and exactly what any curious traveler would want out of an exploratory outing. The most alluring of the smells, aside from the puffed sweet potato loafs lightly toasting under hot lights at several of the booths in the front of the fair, turned out to be one of the more gruesome looking: Ikameshi, sweet rice—stuffed squid, which hails from Hokkaido, Japan’s northernmost prefecture. I gave the less lovingly piled intestinal-looking slime heaps a wide berth, past heated buffet trays lined with mouth-watering jumbo fried crab cakes. 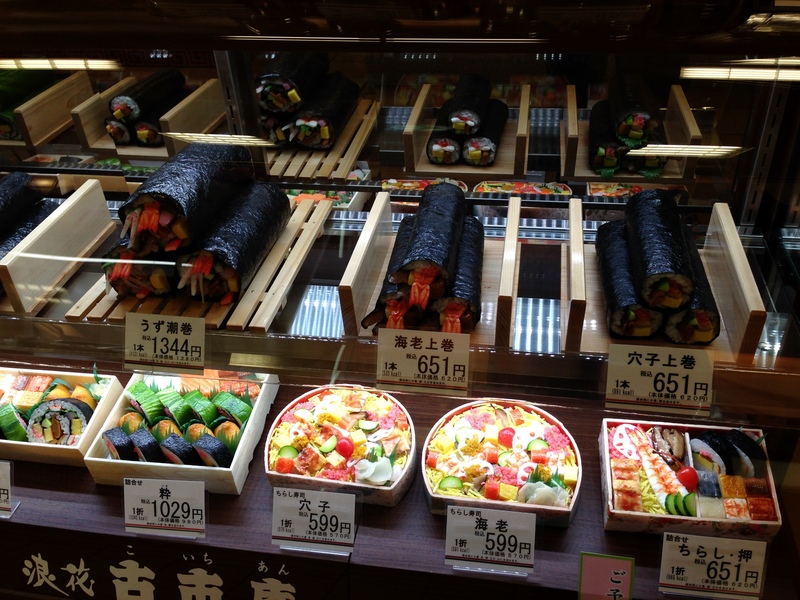 Behind the plastic or glass display cases, perfectly rolled sushi rolls as big as a babe’s arm and ornately arranged bento boxes shined in what I had assumed was a toxic veneer of sprayed laminate. 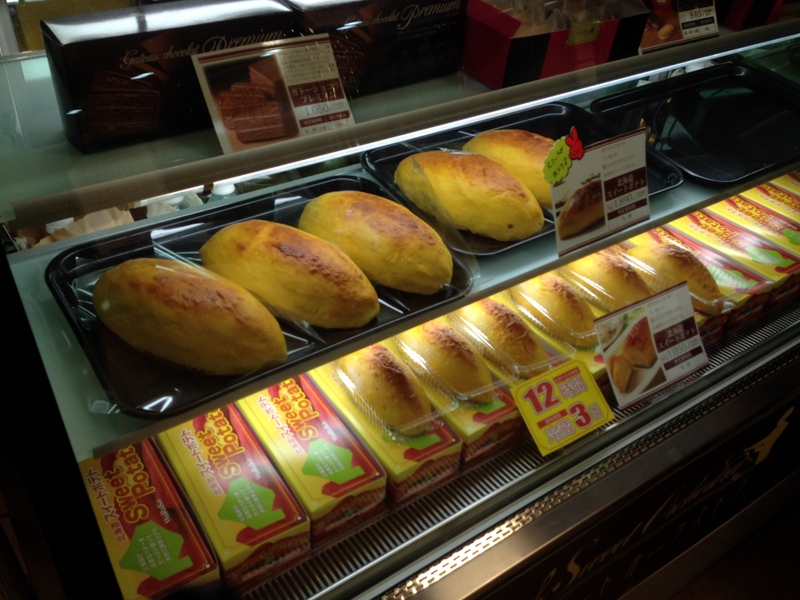 Upon a little research, however, these and much of the food shown in the many store-front displays here are plastic replicas. In fact, fake food goes back some ways in Japan, evolving from short-lived wax-made models in the Shōwa period (1926—1989) to today’s vinyl makes with a much longer shelf life. The phenomenon, according to several sources, was spurred by Western influence and has its value today for tourists braving an all-Kanji menu in less English-prevalent prefectures. In addition to some fan literature on the subject – including Yasunobu Nose’s Japanese People Eat With Their Eyes – there is a famous street in Tokyo, Kappabashi-dori, lined with shops selling plastic restaurantery from fake knives to the most intricately detailed blue-backs. As much as I enjoy gawping at and drooling over the all-too-perfect window works, I still have a long way to go in learning Japanese if I want to try all of Japan’s real gluten-free offerings. 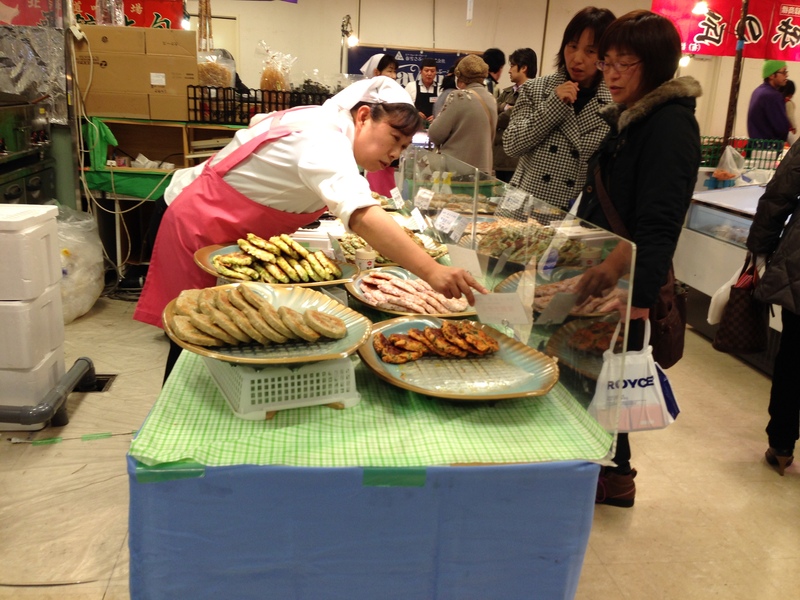 This entry was tagged サンプル, Celiac's Disease, 郡山市, fake food, fish, fish sperm, food allergies, food allergy, Fukushima prefecture, gluten, gluten allergy, gluten-free, Hokkaido, Hokkaido Food Fair, Ikameshi, Japan, Japanese, Japanese cuisine, Japanese food, Koriyama, Koriyama city, milt, mochi, omuraisu, samples, sampuru, soy sauce, squid, sushi, travel, Usui Department Store, wheat allergy. Bookmark the permalink.